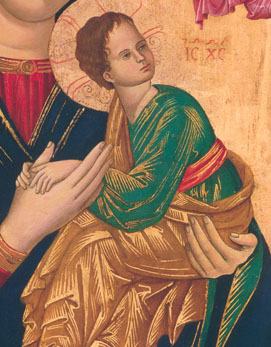 The Child grasps his mother’s hands in fear, as if frightened by something. The hands of Our Mother hold her Son securely; her right hand directs our gaze to Jesus. With her left arm she supports her Child. So closely does she hold him that the lines of his body blend into hers so that it is impossible to separate Mother and Child in the picture.